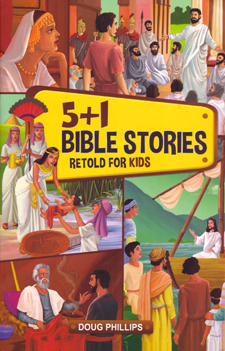 5 + 1 Bible Stories Retold for Kids contains five familiar stories excitingly retold from the perspective of child characters in those stories. The well-known personalities in Doug Phillips's retellings include Joseph, Isaac, Samuel, David and Jonathan. We are also introduced to some other new characters - Suzanna (a maid in Namaan's household), Thomas (a young tent-maker) and Josh (a boy who carried a picnic lunch). The final story is a retelling of the classic 'little boat twice owned' tale which presents a gospel parable. Easy to read and illustrated throughout. 56 pages.